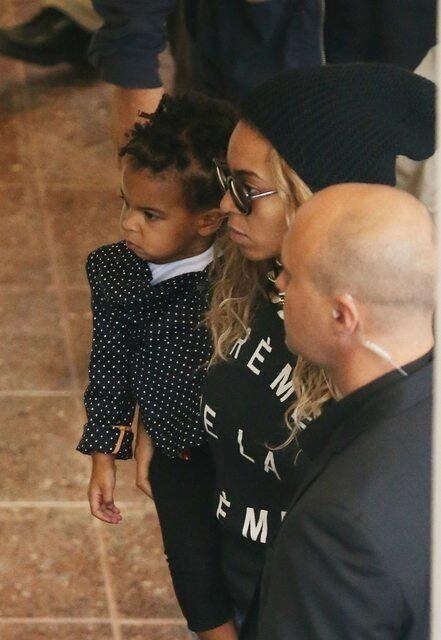 Beyonce makes sure Blue Ivy is always dressed fashionably, and Monday was no exception. While in Melbourne, Australia during a tour stop for her “Mrs. Carter Show,” the 32-year-old walked around with her 21-month-old daughter, who was dressed in a black-and-white polka dot jacket looking more and more like her daddy Jay Z. Beyonce color-coordinated with her daughter, wearing a black sweatshirt with the phrase, “Crème de la crème” written in white, black shades, a black hate, denim shorts, and black sneakers. This entry was posted in Celebrity Kids, Celebrity Sighting, Concerts, Entertainment. Bookmark the permalink.